Background: Our Lady of Mount Carmel, is the name given to the Blessed Virgin Mary by the Carmelite Order. Their origin goes back to the 12th Century, when a group of Christian hermits chose Mount Carmel in the Holy Land to settle. 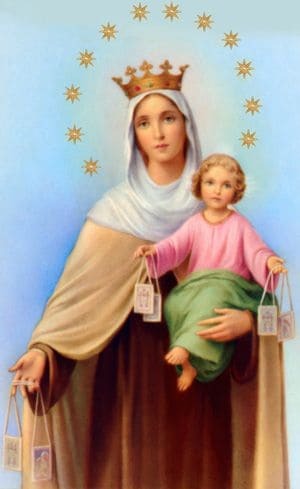 Many miracles have been attributed to Our Lady of Mount Carmel. Perhaps the best known occurred in 1894, when Palmi in Italy, a town of around 15,000 inhabitants, was struck by an earthquake. The quake devastated the city but only nine people died (RIP); most of the town folk were part of a hastily organised prayer procession, behind a statue of Our Lady of Mount Carmel. The procession had been arranged after facial and other changes to the statue were observed over the previous 17 days. The Feast Day is 16th July. assist us in our necessity. Show us that you are our Mother. we are called to live in the spirit of Carmel. and mindful of our call to minister to God’s people. and help to those faithful to you and to your Son. Look down with love, O Gate of Heaven, on all those now in their last agony. Look down graciously, O Virgin, Flower of Carmel, on all those in need of help. Look down tenderly, O Queen of All Saints, on all poor souls. Look down on me… (Share your request and reflect …) but may God’s will be done.